T.J. Loveless has been reading and writing stories since the fourth grade. She writes predominantly in the Spec Fic genres. A former copy/content editor at a small pub house, she now freelances at Cliffhanger Editing. 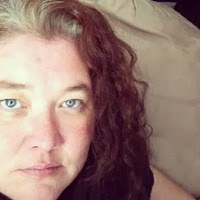 She lives with The Writing Zoo, a Hubby who prefers her mood when writing, and a teenager who loves to tells stories of her mother on the floor trying to visualize "legs all akimbo" and how Writing Momma has long, often yelling, conversations with the computer screen. “Can't disrespect what I never respected in the first place. Thought you guys were supposed to have a superior intellect.” My palms began to melt the plastic ties.